As a full-time blogger, you have the freedom to work from just about any place you could ever dream of. And while most choose to work from home, this isn’t always the best setup. In some cases, coworking spaces make more sense. Generally speaking, a coworking space is a shared office where people from different businesses and professions gather together, yet work independently. They’re essentially shared work spaces that are affordable and functional. They typically charge a monthly fee and offer a combination of shared tables, private offices, and hybrid spaces that land somewhere in between. Coworking spaces can be used by businesses, but are most often leveraged by individuals who work from home and don’t have a traditional work setup. These include freelancers, entrepreneurs, home business owners, and bloggers. One of the more appealing aspects of a coworking space is the flexibility that it provides its members. 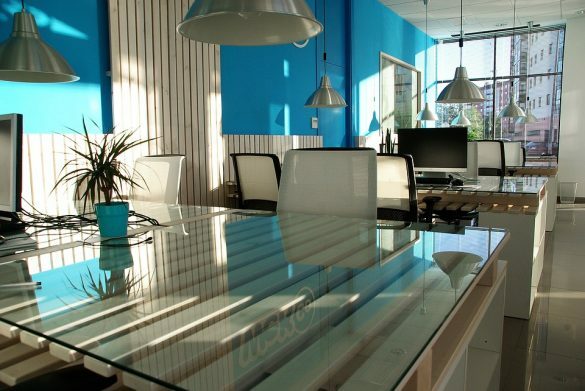 Reputable coworking spaces offer a number of setups at a range of prices – including virtual offices, memberships, dedicated desks, office space, and even entire suites. With this sort of flexibility, any blogger can join a coworking space and utilize a setup that fits their personality and work style. Introverted individuals who need a private setup to stay focused can pay for secluded office space. Extroverted people who thrive on interactions with other people may find a shared desk to be suitable. Even a team of people working together can find a coworking space useful. In the latter case, boardrooms or multi-desk offices are common options. When you work from home day after day, it’s easy to fall victim to burnout. You sit at the same desk, look at the same views, and interact with the same select people. Not only do you get bored, but you’ll also notice that your creativity can quickly be stifled. In a coworking setup, this all changes. It forces you to get out of the house, meet new people, and expose yourself to new things. For a blogger, this sort of stimulation can lead to new ideas and unique ways of thinking. For bloggers, there’s often a sense of isolation and loneliness that emerges in the absence of a traditional workspace. When you join a coworking space, you get to mingle with other people and rub shoulders with professionals from a variety of industries. The community aspect of coworking is one of the most attractive features. Not only does it boost your creativity and enhance the way you think, but it can also provide a source of new clients and networking connections. If you’ve ever looked at renting office space in a busy area of town, then you know just how expensive it can be. Real estate is all about location, and you’ll pay an arm and a leg to be on a desirable street. But with a coworking space, everyone is collectively pooling their resources. This offsets the cost of the real estate and gives you a cost-effective place to work that also happens to be located in a convenient area. As an individual blogger, it doesn’t always make sense to invest in a bunch of resources and materials. But when you have a membership at a coworking space, you may gain access to amenities like printers, copiers, reception services, video conferencing software, etc. The great thing about a coworking space is that there’s very little commitment required in order to test it out. Most coworking spaces offer affordable monthly contracts that let you try out the setup and then cancel if you find that it doesn’t fit your workflow or needs. It’s also important to remember that all coworking spaces are different. If you try one out and decide that you don’t like it, this doesn’t necessarily mean that coworking spaces aren’t right for you. It could be that another space offers the amenities you need to thrive. Look around for a coworking space that aligns with your unique demands and try it for a couple of months. Most bloggers like what they find!